What did the early Yosemite Native Americans wear before whites entered Yosemite? In the early spring of 1851, in order to stop the attacks on gold miners and ranches in the lower foothills, the Mariposa Battalion led by James Savage went up the Sierra Nevada to capture the infamous Chief Tenaya and his band of Ahwahneechees. This incident was when whites first discovered the hidden Yosemite Valley. Chief Tenaya voluntarily turned himself in so the rest of his people could escape. Not satisfied with only the capture of Chief Tenaya the battalion moved on to round up the rest of Tenaya’s people. But by the time the Mariposa Battalion arrived at Tenaya’s main village they found it and other camps empty. The Ahwahneechees had left in such a hurry they left behind everything; basketry, acorn caches, bark houses, small drums, Paiute foods like piuga (dried Pandora Moth larvae), kutsavi (Mono Lake brine fly larvae), tuba (pine nuts), Kua (grasshoppers), and clothing. The Battalion burned everything. The doctor for the Mariposa Battalion, Dr. Lafayette H. Bunnell, documented the items found in the abandon camps on pages 78 and 79 in his book The Discovery of Yosemite. These type of robes were made by Great Basin Indians, mainly Paiute, Monos and Washoes. The robes were called “wega” singular. The most common were robes made of Jack rabbit skins. The robes took up to 180 hundred rabbits and strips of rabbit or squirrel fur were twirled so they were soft on both inside and out and woven together with some sort of plant or sinew. Because Paiutes and other Great Basin Indians like Monos, and Washoes lived in cold desert and high mountain areas like the high mountains of Yosemite and the Sierra Nevada rabbit robes meant life or death in the life of Indians. 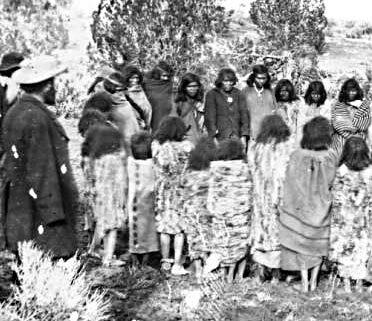 Paiutes wearing rabbit robes. Paiute tribes as far away as Arizona and Oregon all wore rabbit robes. 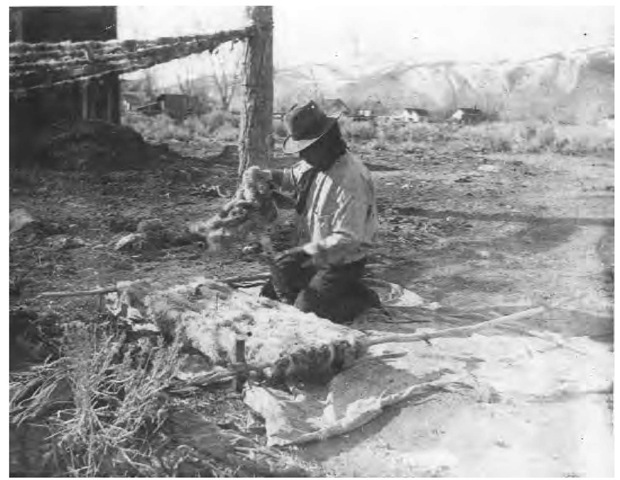 So one item of clothing every Paiute and Great Basin Indian had to have was a rabbit skin robe or a blanket of any other type of animal. They also made moccasins of rabbit skin tied with twined plants or sinew. Jack rabbit was the most common item for clothing because Nevada had millions of Jack rabbits. Skins of water fowl were used as rain coats. This was only one item of Yosemite Indian clothing, but the most important. I will continue to write about other items of clothing that were traditional and indigenous for Yosemite Native Americans. Out of curiosity, I looked for rabbit skin in Miwok Material Culture and found two references. It seems the Miwok obtained them from the Washoe and Mono. That confuses me--I never thought of rabbit as rare--they are all over near my home in San Diego. Why would they trade instead of making their own? The commonest blanket, however, was made by winding narrow strips of rabbit skin about cords and weaving these, using plain cord as woof, into a loose but very warm blanket (plate LXI). It was called ūdjū'le (P), yū'ptī (N, C, S). 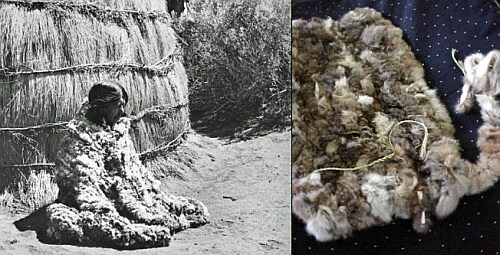 All blankets, particularly of rabbit skin, were used especially as bed covers, but served as garments in cold weather. Except for rabbit skin blankets made in the low foothill region, the Miwok imported most of theirs from the Washo in the north and the Eastern Mono in the south. Dan, note that the Miwoks got that from Washo Indians in trade. That has to be around 1860 or later, because before that like all tribes in the area. Washoes and Miwoks, like the Paiutes and Miwoks, were enemies. Meaning the rabbit robe had to be 'traded' after Yosemite was discovered. The rabbit robe was not created by Miwoks, but by a tribe that was once their enemies at the time Yosemite was discovered. Also Dan, there are two tribal groups around San Diego, one is related to the Washoes and one is related to Paiutes. The tribes in the San Diego region are from the same language and cultural groups as the Washo and Paiute people in around the Yosemite area. They are Hokan and Uto-Aztecan, Miwoks are Penutian. Both Hokan and Numic (Uto-Aztecan) groups made rabbit robes. There is no evidence that Miwoks made them, even in the book Miwok material, the robe was not produced by the Miwoks. Before the white man entered the area Miwoks were fighting Washoes and Paiutes, Washoes were fighting Paiutes and Miwoks, and Paiutes were fighting both, and the rabbit robes were found in 1851 in Yosemite. Note Washoes and Mono Lake Paiutes are the same as the Indian tribes in your area. Miwoks are the light yellow. My guess is the rabbit blankets aren't as needed as much on the western side of the Sierra Nevada because it's much warmer there, at least in Winter, than the eastern side of the Sierra. Maybe rabbits are much more abundant on the east side too. Interesting about the language/cultural groups. I (and most of San Diego County) live in the southern area marked Hokan on the map. I've heard it referred to as Diegueno (named after the despised former mission here) and Kumeyaay. The northern edge of San Diego County area is marked Uto-Aztecan and I heard them say that they can't understand each other's language at all ("them" being the few fluent speakers left). There's actually more Hokan speakers in Mexico, I understand, since they were left alone more than on the US side of the border. If I remember correctly from what was told me, the entire area (Southern California) was formerly all Hokan. Later (I don't know if it was hundreds or thousands of years ago), the Uto-Aztecan invaded leaving the Hokan only on the margins on the map. You probably know this stuff better than I do though. Thanks. Hokan speakers are the oldest California group, than Paiutes expanded north and west centuries ago, and than when the white man entered so did the Penutians or Walla Walla, who followed the whites, who came down from Washington around the same time of Sutter's Fort. The Walla Walla became Miwoks and other groups.